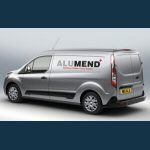 As the name says, Alumend repair Aluminium window and Aluminium door systems, we are based in Huddersfield giving us easy access to the Motorway network, we cover many of the major town's & cities of the UK including Manchester, Leeds, Liverpool, Sheffield, Newcastle & Birmingham. Our highly skilled technicians have a wealth of knowledge in the manufacture and repair of Aluminium window and Aluminium door systems and are able to repair most systems manufactured in Europe. The company was formed to meet the growing demand for repairs to Aluminium systems, the installation in buildings of Aluminium systems has seen huge growth. Alumend is growing its business to compliment that growth. Whether your problem is large or small Alumend are on hand with a dedicated team ready to solve your problem as quickly and cost effectively as possible. Our dedicated service vehicles carry most major parts to solve your problem quickly.